Protect your home and everyone inside from negative energy and evil spirits with the House Protection Amulet. It also protects against excess water and water related natural disasters with Earth energy. The House Protection Amulet is a two sided hanger featuring the Empress of Mount Tai (also known as Bixia Yuanjun) on one side and a protective Bagua on the other side. Tai is a Mountain (Tai Shan in Chinese) in China with a protective wall that stabilizes the entire country. The Empress of Mount Tai's image on the amulet will both protect and stabilize the energy of your home. Stable energy is necessary for good health. The Empress of Mount Tai sent a spirit, known as Shi Gan Dang, to protect the citizens from evil spirits. Both sides of the House Protection Amulet say Tai Shan Shi Gan Dang. This protection hanger calls on Shi Gan Dang, the protector of Mount Tai, to protect you and your home from negativity and evil. 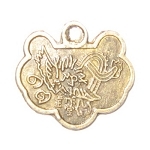 All negativity and evil is frightened by the words on this Feng Shui protection amulet. The House Protection Amulet also includes two red tassels for protection and two authentic Silk Chinese Mystic Knots on top. 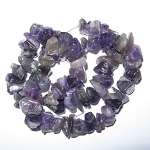 The Mystic Knots will bring you everlasting love, good health and long life, and protection from all negativity. It hangs about 16 inches long. I gave this as a present to a coworker whose home was invaded and her children were having a difficult time dealing with the fear and insecurity that brings. She said she had been looking for something similar but did not have the time to search. She loved it. This item is shipped from Florida by USPS. Shipping and delivery times vary by item and destination. The shipping rate varies depending on your order total and shipping destination. View US and International Shipping Options and Charges. Free Shipping for all US orders. Expect delivery of your order in 3-14 business days, depending on your location. For an additional charge of $15.00 per address, we can expedite delivery to most US destinations. Expect delivery of your order in 2-5 business days, depending on your location. For an additional charge of $25.00 per address, we can express delivery to most US destinations. Expect delivery of your order in 1-2 business days, depending on your location. All of our Feng Shui products have been especially chosen or created by Mark and Leslie Jacobson, experienced Feng Shui consultants. When you order a Feng Shui cure from Zen Appeal, you get an easy to understand instruction sheet that includes information about the product and how to use, or place it, successfully. 15 points will be rewarded to you when you buy this item.